Wisconsin corps including the Madison Scouts, Blue Stars, Pioneer, Racine Scouts and the all-age Kilties gave fans a healthy dose of Midwestern drum corps excitement at the annual Drums on Parade DCI Tour Event on June, 26 in Madison Wis. Also featuring five other World and Open Class corps, the Cadets and Cavaliers threw a one-two punch at the competition, taking first and second places respectively. 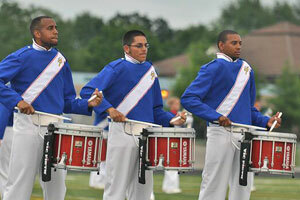 Both the Cadets and Cavaliers have illustrious histories in Madison, winning six of the seven DCI World Championships hosted in Wisconsin's capitol city. View a photo gallery from this event. Photos courtesy Chris Maher, corpsreps.com.